Imprint Method: Unimprinted - Create a path straight to your brand with this open toe Italian waffle slipper! 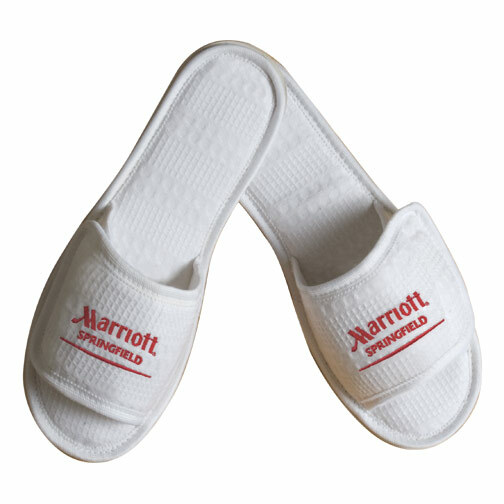 Offered in two sizes, medium (ladies' 7-8) and large (men's 10-11), the white polyester slipper features a hook and loop closure to help get the perfect fit. These are a wonderful advertising tool for hotels, resorts, spas and more. The slippers can be customized with your company's name, logo or slogan to promote your brand and boost awareness within your target audience! Price Includes: Per 1000 stitches. Additional cost to blank price.